As I look forward to attending the annual IYNAUS convention (Iyengar Yoga National Association of the United States) next week in Dallas, Texas, I want to share how I first became involved with this style of yoga and what it means to me. Simply put, the practice of Iyengar Yoga changed my life. I took my first class in 1984 and I continue to be so very grateful I got on that particular mat. B.K.S. 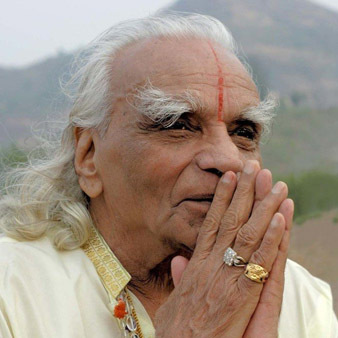 Iyengar, founder of Iyengar Yoga. Initially, I began yoga as a physical exercise, like running or swimming. Immediately, though, there was something different about how I felt after that first yoga class. I felt settled. That experience stayed with me during my job as a pharmacist. I began to see life from a different perspective, perhaps an effect from those twisting poses or inversions. I slowed down. I became a better listener. I had fun! I hated savasana. Asana was the way in for me. Paying attention to the physical aspects of my body led me to experience aspects of my body-mind that I couldn’t see, although I could feel them. Who knew that strength, endurance, and flexibility were more than physical attributes? I wanted others to feel as good as I did. I wanted to tell strangers on the street that Iyengar Yoga opened doors of understanding to other layers of existence—to the Great Mystery. That didn’t seem like a very smart idea! The compassionate self-discipline of yoga had already taught me to stay put and watch my impulses before acting on them. The world became my mat. Using blocks and straps on the mat taught me how to use problems and challenges of life as support for growth rather than as obstacles to happiness. I learned that everything changes—the weather, my body, and especially my mind. I learned that I have no control over external circumstances, although I do have at least some control over how I respond to them. I credit this understanding to the ongoing practice of yoga, to the determination of staying put in a difficult pose, like savasana. Who knew that corpse pose entailed dropping the ego as much as dropping the body? An ongoing practice brings me “from the periphery to the core to the periphery”—to borrow the theme of the 2016 IYNAUS convention. Although I first attended yoga classes for the exercise, I stayed for the other benefits I received beyond the physical. These benefits are hard to put into words, but I suspect as yoga students that you experience them, too. As a teacher, I witness the changes in energy that flow through students during class. I see the transformation! Students also share with me how yoga off the mat has given them valuable tools for engaging with life’s challenges. The theme of the IYNAUS convention is “Exploring the Path of Practice,” and that about sums it up. I practice Iyengar Yoga because the practice itself—especially in savasana—is an exploration into uncharted territories of the self. While I’m away from April 11 to April 18, please explore your practice with the wise and generous instructors who are teaching my classes (see Schedule). I’ll see you when I return, full of new ways to be on the mat together. Previous PostPrevious Yoga Ropes Workshop!